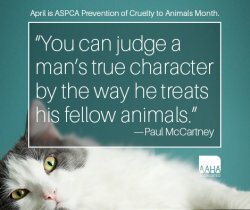 Prevention of Cruelty to Animals Month! April 6: National Siamese Cat Day. April 7-13: National Dog Bite Prevention Week. April 8: National Dog Fighting Awareness Day. April 10: National Hug Your Dog Day. April 14-20: Animal Cruelty/Human Violence Awareness Week. April 23: National Lost Dog Awareness Day. April 24: International Guide Dog Day. April 28: National Pet Parents Day. April 30: National Therapy Animal Day. The spring and summer months are peak flea and tick season in Florida. Although the insects thrive in tall grass and wooded areas, you may also find them in your backyard. You can reduce your pet's risk of a flea- or tick-borne illness can be as simple as taking a few of these preventive steps. Make your yard less hospitable to fleas and ticks. Clear debris and piles of brush to prevent fleas and ticks from invading your yard. Do not cut your grass to short or leave it too long. When grass is too short, the spiders and ants that provide natural flea control will move out. It's best to keep your grass at least two inches high. Protect Your Pet with topical or oral flea and tick medication. The products kill adult fleas and ticks and stop the development of larvae and eggs. Check with Dr. Daniels to decide the best preventative for your pet. Check Your Pet for Ticks and Fleas Regularly. Perform a tick check every time your pet returns inside after spending time outdoors. Start the check by running your hands over your dog or cat's head and body. Then check your pet's paws and ears. As you perform the tick check, take a closer look at any unusual bumps. Removing ticks as soon as possible is essential for your furry friend's health. Heartworm disease is caused by a parasite lives inside the heart and blood vessels of the lungs. Heartworm disease is transmitted by mosquitoes. The symptoms of heartworm disease are subtle and can be easy to miss. As the number of heartworms increases, the symptoms of coughing, lethargy, exercise intolerance, lack of appetite and weight loss become more apparent. 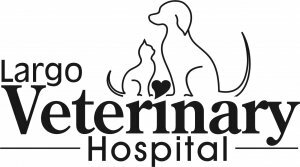 Most people know that heartworm disease affects dogs, many are unaware that it can also affect cats. The fact is any animal can be bitten by a mosquito and therefore become infected with the parasite. Heartworm disease is most commonly diagnosed using blood tests that detect the presence of heartworms. The best way to treat heartworm disease is to prevent it in the first place. Speak with Dr. Daniels to decide on the best preventative for your pet. 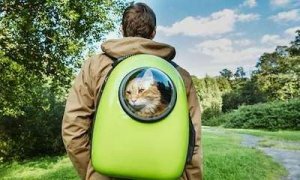 Cat backpacks, the new trend in feline transportation. Why do puppies & dogs eat poop? What to do if your pet is stung. Understanding a dog's body language is a key way to help avoid being bitten. Know the signs that dogs give to indicate that they’re feeling anxious, afraid, threatened or aggressive. try to make herself look bigger. Her ears may be up and forward, the fur on her back and tail may stand on end or puff out, and her tail may be straight up—it may even wag. have a stiff, straight-legged stance and be moving toward or staring directly at what she thinks is an approaching threat. 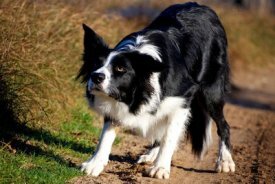 Continued approach toward a dog showing these types of body language could result in a bite. try to make herself look smaller. She may shrink to the ground in a crouch. put her tail between her legs. flatten her ears back and yawn. look away to avoid direct eye contact. stay very still or roll on her back and expose her stomach. try to turn away or slowly move away from what she thinks is an approaching threat. If she can’t retreat, she may feel she has no other alternative but to defensively growl, snarl or even bite. Many dogs can show a mixture of these body postures, indicating that they feel conflicted. Remember to avoid any dog showing any of signs of fear, aggression or anxiety—no matter what else the dog is doing. It’s important to realize that a wagging tail or a crouching body doesn’t always mean friendliness. Basic first aid procedures for wound care: Even the most docile pets may bite when in pain, so it would be best to muzzle your pet or at least be very aware that your pet might bite. Here's how to tie a temporary muzzle using gauze. Keep your pet as warm and as quiet as possible. If there is the possibility of broken bones, find a flat surface (like a board or stretcher) that you can use to transport the pet from place to place. It’s also a good idea to secure the pet to the surface with a blanket or towel. First aid care is not a substitute for veterinary care, but it may save your pet’s life until it can receive veterinary treatment. Any first aid administered by you should be followed by an immediate visit to Dr. Daniels. For large dogs, close the dog’s jaw tightly and breathe into the nose. The dog’s chest should rise. Give 2 breaths. For small dogs and cats, you may be able to cover the nose and mouth with your mouth as you breathe. The animal’s chest should rise. Give 2 breaths. For large dogs, you may be able to position the dog on its back and compress the chest just like for humans. For small dogs and cats as well as large dogs with funnel chests, you may need to lay the animal on its side and compress the side of the rib cage. Alternatively, you can position the animal on its back and press on both sides of the rib cage. Hi my name is Toulouse Holtz and I am Largo Veterinary Hospital's April 2019 pet of the month! 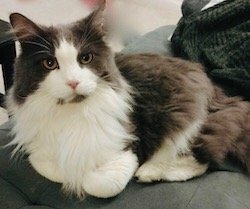 I am a 14 year-old domestic long haired feline. My mom adopted me when I was a kitten. My favorite way to squeeze in some exercise is when mom gets the laser pointer out...I just love to chase it around the house! I also love to play with my catnip toys and my favorite treats are Greenies. Mom says I'm mischievous because I like to pull clothes out of the hampers and leave them around the house. What can I say, I just like reorganizing. I am so spoiled that I even get to sleep with mom!